2016 VW Tiguan 2.0 TDI 150 review | What Car? The previous VW Tiguan SUV was the company’s third most popular model in the UK, but when you’re at the mercy of a hotly contested class and pitched against a spectrum of cars ranging from the acclaimed Nissan Qashqai to the excellent BMW X1, you can’t stand still. It’s a lesson VW understands well, so it's thrown everything at this all-new Tiguan. Grounded on the MQB platform that underpins the current VW Touran, the new car is longer overall, but, crucially, has an extra 77mm between its wheels to give it a roomier cabin. The boot is bigger too, ranging from 615 litres with the rear seats up, to 1655 litres with them folded flat. All this has been achieved with a reduction in weight that, along with better aerodynamics and more efficient engines, makes it cleaner and up to 24% more economical. 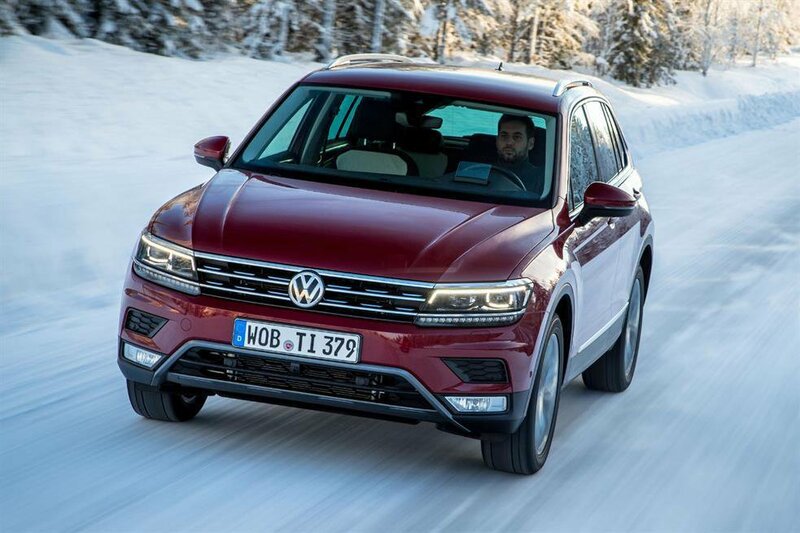 VW has designed it to be better off-road as well, giving it a higher ground clearance than the previous Tiguan. If you go for the 4Motion four-wheel drive version, it has selectable driving modes that tune the electronic systems to improve performance on snow or mud. On top of this, the new model can tow up to 2500kg. There’s also new technology to improve safety and convenience. Every second-generation Tiguan comes with lane assist, front collision warning and autonomous city braking that detects impacts with cars, as well as pedestrians; if that fails, there’s also a post-collision braking system, seven airbags and an ‘active’ bonnet that softens the impact of anyone unfortunate enough to collide with it. The new infotainment system includes Apple CarPlay and MirrorLink to connect your phone to the standard 5.0in touchscreen. An upgraded media package offers an 8.0in screen with online features, such as real-time traffic data. Other options include LED headlights and rear climate control. As the car’s not on sale in the UK until April, there’s no official word on fuel consumption, equipment levels or prices, but we expect prices to start from around £23,000. What’s the 2016 VW Tiguan 2.0 TDI 150 like to drive? This is a very early taster of pre-production models on frozen Swedish roads, but, while we'll have to wait until later in the year for a definitive test, the initial signs are that it should be worth that wait. A range of 1.4-litre and 2.0-litre petrol engines will be available, but the various 2.0-litre diesels should prove the most popular. Most versions will be available with manual and automatic gearboxes, plus two or four-wheel drive. We tried the second most powerful diesel engine, which has 148bhp, allied to a DSG dual-clutch auto gearbox with 4Motion four-wheel drive, and found it an effective combination. The engine’s happy to pull from low revs but has plenty of shove in the mid-range, which is just what you need for relaxed progress in real-world driving. The seven well-spaced gears keep the engine in its most effective operating range, and the auto changes happen quickly and smoothly. Meanwhile, on the snow, the Tiguan feels very surefooted. You can really feel the four-wheel drive system shifting power between whichever wheel has the most grip – something that should be equally helpful on greasy UK roads. The old car had a bit of a hard ride, but first impressions of the new model, fitted with the larger 19in wheels, is that it’s a lot smoother. The steering also seems well weighted and gives good feedback on how much grip is at your disposal. Refinement seems good, too, with little noise or vibration from the engine reaching the cabin, and only a modicum of wind noise at motorway speeds. What’s the 2016 VW Tiguan 2.0 TDI 150 like inside? If you’re familiar with the previous Tiguan, the first thing you'll notice is the improved sense of cabin quality; it’s now broken rank with the Qashqai and feels closer aligned to premium brands, such as BMW and Audi. There are soft-touch plastics that look and feel good on obvious elements like the upper dashboard and doors. The dashboard is well thought out, too, with clear dials and a sculpted design that angles the major controls towards the driver. If you want, you can also exchange the analogue instruments for a 12.3in screen that displays anything from sat-nav maps to your media info, as well as add a useful head-up display. A height adjustable driver’s seat and fully adjustable steering wheel help deliver a fine driving position, and ample front head and leg room means anyone six feet tall will have no problem fitting in. There are also plenty of cubbyholes and big door bins for all your odds and ends. The biggest space gains are in the rear. With 29mm of extra leg room over the old car, it’ll fit two tall adults with ease, or three at a push. Head room is also excellent unless you specify the panoramic sunroof, which makes it a little tighter, especially for the middle-seat passenger. You can alter the angle of the rear-seat backrest and slide the rear bench forwards or backwards by up to 18cm, improving rear passenger comfort or boot space, as required. The boot itself is one of the best in the class; it has no load-lip and the rear seats fold 40:20:40 using convenient levers by the tailgate, which is powered on certain models. When the rear seats are down they leave a completely flat load deck if you raise the boot's dual-height floor. As we’ve said, this is a preliminary drive rather than a full-on road test, and with so many of the finer details missing we can't fully endorse the new Tiguan just yet. That said, if you’re on the look-out for a small SUV, it is definitely worth waiting for. What we can say is it's exceptionally practical and feels very good to drive. If the price and equipment levels are competitive, and the running costs stack up, there’s every chance it could be a class winner.